According to Deuteronomy 7, God commands Israel to exterminate the indigenous population of Canaan. 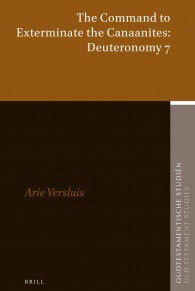 In The Command to Exterminate the Canaanites: Deuteronomy 7, Arie Versluis offers an analysis and evaluation of this command. Following an exegesis of the chapter, the historical background, possible motives and the place of the nations of Canaan in the Hebrew Bible are investigated. The theme of religiously inspired violence continues to be a topic of interest. The present volume discusses the consequences of the command to exterminate the Canaanites for the Old Testament view of God and for the question whether the Bible legitimizes violence in the present. Finally, the author shows how he reads this text as a Christian theologian.